Have you had bitter melon? Do you like it? Have you cooked with it? What is your favorite bitter melon dish? (If you could share your bitter melon stories in the comment section, I’d be grateful.) This one is mine. I have never made or eaten bitter melon prepared any other way. I season about 3/4 pound of ground pork or turkey with some “white” soy sauce, minced large garlic clove, a couple of grinds of white pepper and set it aside. Then I take a large bitter melon and cut it crosswise into approximately 2.5-inch pieces. With a paring knife or a melon baller, I scoop out the seeds and membranes in the middle of the melon and scrape the inner walls clean. The seasoned ground pork then goes inside the cavities. 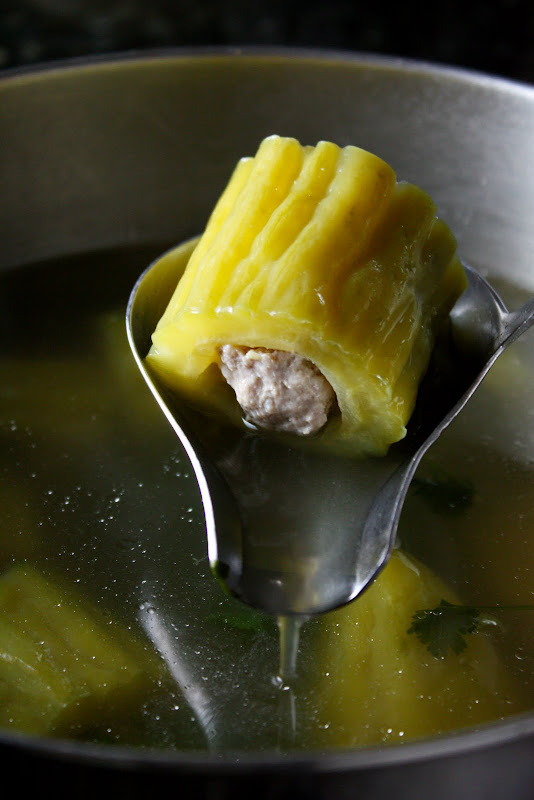 The stuffed bitter melon pieces are arranged in a medium pot and I cover them with simple chicken stock (made from nothing but fresh chicken carcasses; no herbs or vegetables). The whole pot is brought to a gentle boil, covered, and simmered for 20 minutes. Mom said the lid was to remain on the pot at all times lest the bitter melon become too bitter. I can’t find a scientific explanation for that, but the method has worked well and I have zero interest in fixing what ain’t broke. Season to taste with fish sauce and garnish with cilantro leaves. The soup is served the Thai way, i.e., with rice as a main course. While I lived in southern Japan, they would prepare bitter melon as a stir fry called Chanpuru. It wasn’t so bad. I’ve tried to make it myself at home and haven’t had very good results. Always ends up too hard or too bitter. 30 mins in chicken stock looks like a good way to fix that! I will have to try it out. I actually went to a bitter melon festival there, and got to try it cooked like 10 different ways, including pickled and chocolate covered!! My one and only attempt at cooking bitter melon (ampalaya in Tagalog) was a failure of epic proportions. I did everything my mother told me to remove the bitterness – seeded it, scraped off the pith/white parts, sprinkled with salt and let sit – but to absolutely no effect. It was so bad that I’ve been put off from trying it again. Perhaps your recipe could convince me otherwise . . .
We normally eat stir fried bitter melon & short spare ribs/beef/squid with black bean sauce here. Also we drink white bitter melon juice with lime and honey. I’m not a big fan of bitter melon, but I do eat it every once in a while. There’s a dish in the Philippines called ampalaya. I think is sauteed with some other veg. I’d be interested in trying in soup. I’m not a fan of ampalaya, unfortunately… I taste it maybe once a year to see if I’m “mature” enough to handle it, but maybe I’m a supertaster (heh) and I can’t take it! i love this, unfortunately no one else does in my household ! Oh my parents tried to impress on my siblings and I the wonders of bitter melon, from earth (very large garden) to table. It would be the only bit of local eating that I ever disliked and that was almost 25 years ago. I love love love bitter melon, seriously. When I prepare it, I don’t do any of that salting, squeezing, washing stuff to take away any bitterness–I WANT the bitterness! Used to hate bitter melon but love it now! I usually braise it with chicken though, this is new, looks and sounds great! I don’t think I’ve ever tried bitter melon, but I’d like to try it exactly like this! I’ve never tried bitter melon, would love to find it somewhere to try! Your soup looks fantastic! I’ve never tried bitter melon, been a wooze, but maybe I’ll brave it if I can be guaranteed results as you described. I’ve just heard such horror stories that its got me scared silly. i LOVE bitter melon. i used to hate it but now i can dig it. i’ve had it this way and also, just scrambled with eggs. to fight off the bitterness, i blanch it first and then cook it. my grandfather was from the philippines and would slow boil a whole chicken chopped into large pieces (bones and all) with bitter melon, fresh ginger and garlic. I’m sure there was some soy sauce in there somewhere. He would serve it over white rice. To this day my family swears that it is a health tonic and the very best way to knock out a cold. I love to eat it this way and cook it on occasion in his honor. My mom seeds and washes it, then chops it up and sautes it with tomatos,onions,garlic and ginger and pours it over rice.It isnt’ my favorite thing, but she loves it. I love all of your suggestions. I have seen recipes for stuffing it with ground shrimp too. I love bitter melon. It is like crack to me. I crave it every couple of weeks. I never liked it as a kid but now I love it when stir fried with salted duck egg. Look for the salted duck egg at any Chinese market. You just mash up the egg and stir fry the bittermelon first until it turns slightly brown and add in the salted duck egg! I love it! I think the saltiness counteracts/complements the bitter. Delicious combo! It is one of those things, you either love it or you don’t. It is amazing how similar our food is, Leela. My mum makes delicious bitter melon omelette. A few eggs beaten with very thinly bitter melon, coriander leaves, green onions, seasoned with salt and pepper and a splash of fish sauce. Sometimes she also adds a bit of chopped up salted dikon (salty and crunchy!). My sisters and I love it with rice porridge! You can hardly taste the bitterness. I love bitter melon too!! I had a boyfriend who made it for me the first time – he stuffed it with pork Chinese style and I was hooked. I make it for myself now and have turned many people on to it. I feel that the sweetness of the pork makes a perfect balance with the bitterness. I have cooked out the bitterness but I try not to any more. I find I crave the bitter flavor too. As kids our mum would make this memorable dish similar to your recipe as it was to prevent colds and flu’s . i only ever replicated once after she’d passed away to remind me of how good of a cook she was, but as always it wasn’t the same. My mom and dad made this soup often at home. As kids, we would fish out the ground pork but leave the bitter melon to my parents! I couldn’t stand the taste Now that I’m older, I like the melon sliced thinly with scrambled eggs, scallions, and lots of white pepper over steamed rice. I don’t know if my Irish-American husband will enjoy the bitter taste though. I have some of this on my kitchen counter right now. We call it Karailie (car-eye-lee) here in Trinidad and make it a number of different ways in my home. When it’s stuffed and curried, it called kaloungie. Other times we slice it thinly and fry it down (veryyy little oil) with potato cubes or salted fish and eat it with roti, or else we have it with chicken seasoned up nicely with lots of ginger and garlic and served on rice. Though I came to this recipe ‘by mistake’ I’m glad I did because I;d surely like to try this new recipe. Lots of people here have different methods that they swear by to remove some of the bitterness – from sprinkling with salt to soaking in water to leaving it on a tray in the sun for a few hours but we skip all that and just throw it straight into our pot! Lauries – Fascinating. Thank you so much for sharing! Kasma has a recipe for bitter melon stir-fried with egg, which I’ve adapted, adding crushed garlic and dried chillies to the oil first. I love it! Also, stir-fried spare ribs (or duck) with bitter melon and black beans. Or curried! This is my first time here at this web site. I love Thai Food & wanted to learn how to cook them. I was born in Vietnam, and my Mom made stuffed bitter melon soup also. The pork mixture that she stuffed the bitter melon with has chopped mung bean threads, chopped black fungus mushrooms, onions, garlic, salt & black pepper,& fish sauce. I also stir fried thinly sliced bitter melon in cut up browned crispy bacon & onions. Then add a scrambled eggs & fish sauce when the melon is still a bit crispy.